NASA model from 1965 shows the earts size seen from the moon. The following official NASA photograph 65-H-161 was released on Feb. 15, 1965. The information on the backside reads: "This is a model of a small region of the lunar surface based on the area covered in the final p-camera picture transmitted by Ranger VII. This model was made by a photo-metric scaling process, a technique developed by Dr E.H. Shoemaker, USGS, Astro-Geology Branch, Flagstaff, Arizona." The model is made on a scale of 1:20 (1"=0.6 meters - 1"- 1 2/3 ft.). The scaling technique used the different brightness levels in the picture transmitted by the Ranger VII to obtain the relative hieght or depth of hills and craters; however, this technique causes an error of about 5% in linear dimensions. The model of the astronaut and the LEM are on the same scale. Area in the model is approximately 32 x 36 meters or 106 ft. x 119 ft." Link to caption. The Earth in the image is not mentioned in the description but it is clear that they tried to scale the complete model and it would be very strange if they wouldn't scale the Earth in the background. Many unmanned spacecraft had already been to the moon and NASA knew how the Earth would look from the moon. 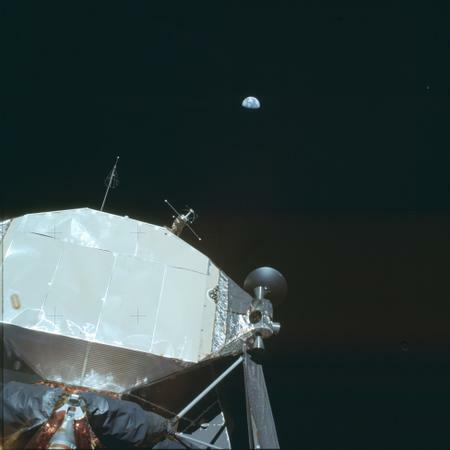 Why do the official Apollo photographs of the Earth seen from the moon show a small Earth. Lets have a look at the official Apollo mission photographs of the Earth seen from the moon. It looks completely different when compared the the 1965 scale model. 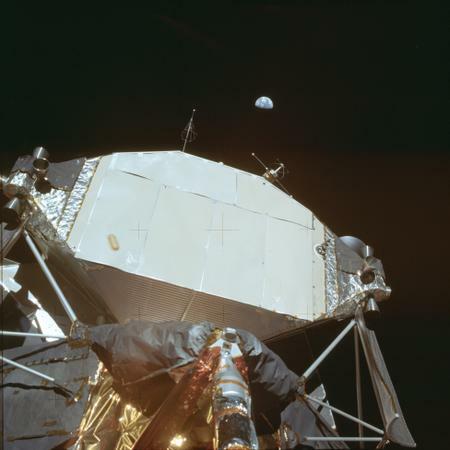 The reason that NASA kept the Earth small in the official Apollo photographs is, because they couldn't show the Earth in its full size as any detail that was wrong would immediately be pointed out. NASA's solution to the problem just make a small Earth and ignore the obvious. Once Apollo 11 had set the standard for the size of the Earth their was no way back for NASA. You are the judge in a journey towards the truth. Credits to NASA for the Apollo 11 mission photographs and 65-H-161.